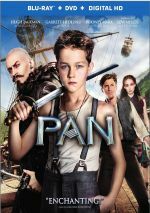 12-year-old orphan Peter is spirited away to the magical world of Neverland, where he finds both fun and danger, and ultimately discovers his destiny - to become the hero who will be forever known as Peter Pan. Hollywood seems to love prequels these days, and we get another from 2015’s Pan. Rather than retell the same JM Barrie story that’s come to the big screen 10 kazillion times – most notably via the 1953 Disney version - Pan tells us what happened before Wendy and her brothers met the boy who’ll never grow up. A mysterious woman (Amanda Seyfried) leaves her baby Peter on the steps of the Lambeth Home for Boys in London. After that, we meet Peter as a 12-year-old (Levi Miller) smack dab in the middle of World War II. His pal hopes they’ll get evacuated elsewhere, but Peter steadfastly believes his mother will return for him, and he wants to stay in London so he doesn’t miss her. It turns out that the orphans don’t go to live with new families – instead, “caretaker” Mother Barnabas (Kathy Burke) sells them to minions headed by evil pirate Blackbeard (Hugh Jackman). He takes the children to Neverland and uses them to mine fairy dust. Of course, Peter has a certain special something, and that begins to manifest itself when he befriends another miner, James Hook (Garrett Hedlund). We follow their adventures and see how Peter becomes Peter Pan. Whenever a famous work brings us a “fully-formed” character, the option for a new “origin story” emerges. In theory, I like this concept. If done well, I think it can be fun to explore what made a legend that way, so I went into Pan with hopes it would be an enjoyable twist on the narrative. At least Pan doesn’t give us the same old, same old, so it comes with room for new exploration. 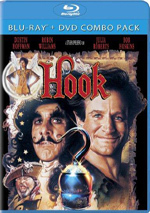 Of course, so did 1991’s Hook, and that didn’t work out too well. While flawed as a whole, Hook does include some very satisfying moments. Unfortunately, I can’t say the same for Pan, a confused, muddled mishmash with little to make it enjoyable. Perhaps the film’s biggest problem comes from its general sense of joylessness. Pan feels like Adventure By Numbers, especially in terms of its purpose as a prequel. The movie goes through many of the important characters/connections that allow it to lead up to Peter Pan, but it doesn’t integrate these well. Instead, it feels like Pan checks off boxes. How does Peter meet Hook? Check! How does he get to know Tiger Lily? Check! How did Smee join Hook? Check! And so on, though the film omits at least one major “prequel moment” that I won’t reveal. Oh well – I guess the filmmakers wanted to leave something for the next chapter. Since Pan fizzled at the box office, that second story seems unlikely to emerge, and the filmmakers can only blame themselves for its failure. Pan delivers a spiritless adventure without any spark or charm. It feels as though it wants desperately to bring us a rollicking adventure but it doesn’t know how to do so. Which may be true at the core. Director Joe Wright remains best known for dramas like Pride & Prejudice and Atonement, so a story like Pan seems like a stretch for him. He did direct the 2011 action flick Hanna, but it followed a dark/serious path, not the lightness and whimsy needed for Pan. Rather than rise to the occasion, Wright makes Pan a dull “adventure” without any creativity or spark. He shows no flair for the action scenes, so those come across as in a perfunctory manner. Pan also comes with a serious sense of déjà vu for movie fans, as it borrows from many, many other films. A slew of nods toward Star Wars occur, and more than a little Matrix shows up as well. That’s just the tip of the iceberg – viewers can identify many other obvious lifts without much effort. Heck, Hook offers nothing more than a blatant rip-off of Indiana Jones. If Wright brought a sense of excitement to the tale, I wouldn’t mind the cinematic thievery as much. However, without anything fun on display, the influences become more of a problem, perhaps because they make me wish I could watch those other movies instead. It really is that lack of fun and adventure that cripples Pan the most. Even with a myriad of plotting/thematic flaws, I could forgive the problems it I found something entertaining here. But I don’t. Pan lacks any form of wit, whimsy or excitement. It comes across like forced bombast and not an involving exploration of the characters and situations. While the movie shows promise, the end result bores. Pan appears in an aspect ratio of approximately 2.40:1 on this Blu-ray Disc. The film offered a good transfer. Sharpness appeared positive. Any softness remained minor and resulted from stylistic choices. This left us with a well-defined effort. No jagged edges or moiré effects occurred, and edge haloes remained absent. The movie also lacked print flaws. In terms of palette, Pan favored a combination of teal and amber. These remained restrained but appeared fine given stylistic choices. The hues managed to pep up some as the film progressed, and those moments worked well. Blacks showed reasonable depth, and shadows were good, though they could seem slightly dense at times. This felt like a “B+” presentation. I felt consistently pleased with the enjoyable Dolby Atmos soundtrack of Pan. Downconverted to a Dolby TrueHD 7.1 mix, the end result impressed. With lots of action on display, the soundscape offered plenty of room for information to emanate from the various speakers, and it used those chances well. The mix delivered lots of auditory material that spread out across the speakers in a satisfying manner and that blended together nicely. This meant an active track. The surrounds worked as nearly equal partners and kept the mix humming. The action/flying scenes fared best, but plenty of other lively moments made this a consistently positive soundfield. Audio quality also satisfied. Speech was natural and concise, while music sounded peppy and full. Effects turned into the primary factor, and those elements appeared accurate and vivid. I thought this became an active, involving mix. As we head to extras, we start with an audio commentary: with director Joe Wright. He provides a running, screen-specific look at story/character areas, stunts and action, cast and performances, sets and production design, visual effects, editing, and connected areas. Wright brings us a consistently good but not great chat. He touches on all the appropriate subjects but there’s just something missing from the result. While enjoyable and informative enough, the track never turns into anything really strong. Four featurettes follow. Never Grow Up: The Legend of Pan goes for 10 minutes, 50 seconds and offers info from Wright, screenwriter Jason Fuchs, producers Greg Berlanti, Sarah Schechter and Paul Webster, Peter Pan historian/playwright Piers Chater Robinson, and actors Garrett Hedlund, Rooney Mara, Levi Miller, and Hugh Jackman. “Legend” looks at the source work and its adaptation for Pan. Despite some fluffy moments, the program gives us a pretty good exploration of the subject matter. During the six-minute, seven-second The Boy Who Would Be Pan, we hear from Jackman, Wright, Miller, Webster, Hedlund, Mara, Fuchs, and actor Amanda Seyfried. Here we learn about Miller’s casting and performance. This one includes a few decent moments but it mostly praises Miller, and that makes it tedious. 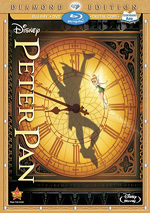 The Scoundrels of Neverland lasts five minutes, 49 seconds and features Wright, Fuchs, Jackman, Hedlund, Schechter, Webster, and actors Nonso Anozie, Bronson Webb, and Jimmy Vee. The show looks at Blackbeard and his mates. A moderate amount of information emerges here. Finally, we go to Wondrous Realms. In this five-minute, one-second piece, we locate trivia about the film. These moments include a tour of various locations and trivia tidbits. Thought clearly aimed at children, “Realms” offers a few interesting elements. The disc opens with an ad for The Iron Giant. No trailer for Pan appears here. A third disc provides a DVD copy of Pan. It includes “The Boy Who Would Be Pan” but none of the other extras. Although I appreciate the movie’s attempts to bring something new to the well-known legend, Pan falls flat. It simply lacks the excitement and fun one wants from an adventure such as this. The Blu-ray delivers very good picture and audio as well as a few interesting supplements. Pan could’ve been enjoyable but it ended up as a dud.